The 'Read Write Inc. Phonics' storybooks provide structured practice for children in decoding words and reading through phonics. Each set of books is carefully graded so children can read them with confidence. The Read Write Inc. Phonics storybooks provide structured practice for children in decoding words and reading through phonics. Each set of books is carefully graded so children can read them with confidence. Read Write Inc. Phonics storybooks help parents support their child by: BL Using Ruth Miskin's successful tried-and-tested phonic methodology for reading success BL Offering practical and effective advice in guiding their child through every story BL Building confidence using fun and engaging stories with opportunities for talk and praise throughout The structured phonic stories in Books 3c and 3d are written for children to gain confidence as they read one whole story to a parent from beginning to end with plenty of phonics practice. 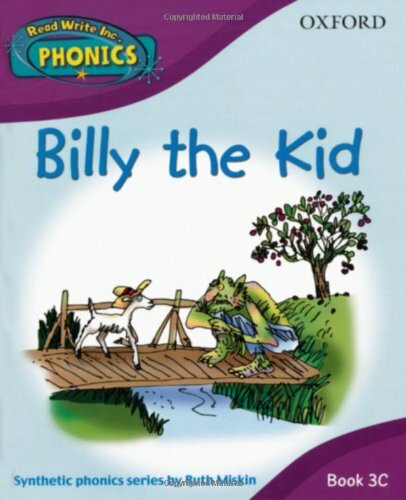 Reading steps for success: BL Practise reading the Speed Sounds before each story BL Read the Red and Green words before each story BL Read the story to decode every word BL Re-read the story to reinforce meaning BL Re-read the story for fluency Billy the Kid, Book 3c is a fun, lively story about three billy goats (Mum, Dad and Billy the Kid) who want to cross a bridge to get a red plum, but are stopped by a troll. Every rhyming story uses artwork by Tim Archbold, who uses a style that has been likened to Quentin Blake's, which children love. It is recommended that parents use the RWI Phonics Speed Sound Flashcards Set 1 and Sets 2 and 3 to practise before and alongside children reading any of the RWI story books. RWI Level in Schools: Although these books have been created for the home market, they have been written to Purple Level of the RWI school books. The creator of Read Write Inc., Ruth Miskin, is currently involved in a series of nationwide training programmes for primary schools, commissioned by the UK government's Department for Education and Skills.